Over the past 18 years LGVS has grown from an owner-operator business, to a small company employing up to 11 staff during vintage. in Krondorf in the 1850s. Shortly after that the first Grocke vineyard was planted. My enthusiasm for contracting began when I helped my father Warren with his hay contracting business in the mid1980s. Naturally, these paths led me to combine the love for contracting and passion for vineyards. So began LGVS in August 2001. LGVS has grown and evolved over the last 18 years. 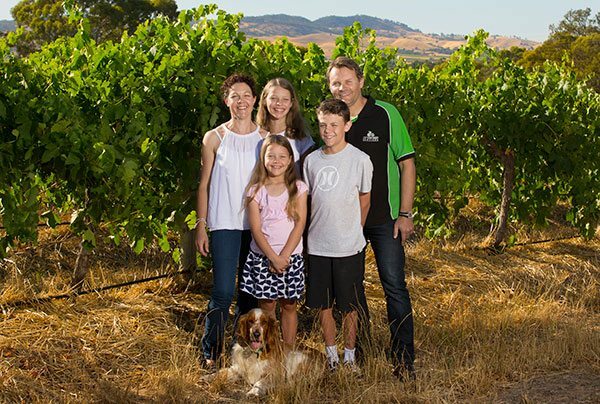 I now live on the outskirts of Tanunda, with my wife Nicole and three children Ethan, Jacinte and Claudia on our own vineyard property. Our range of vineyard contracting services include machine harvesting, under-vine compost or mulch banding, under-vine straw mulching, fungicide and herbicide spraying, to name a few. Our equipment is up to date, maintained to the highest standards and all our work is carried out with the needs of the vineyard owner in mind. Over the years I have developed a passion for soil health in vineyards. I truly believe great wine begins at ground level. A balanced soil grows a healthy vine, making it less susceptible to pests and diseases, resulting in more consistent yields and higher quality wine. Personally, I gain as much satisfaction working in our customers vineyards as I do in my own. Twenty five years of grape growing has given me valuable experience and knowledge. Working together with vineyard owners, LGVS provides a high quality vineyard contracting service. Customer satisfaction is our priority! LGVS is proud to be involved in producing exceptional quality wine grapes in the Barossa and we look forward to an exciting future for our amazing wine region. We work closely with grape-growers and winemakers and we love what we do. The Barossa Valley is our home and we are 100% focused on helping our local vineyards. Our clients become part of our family and we appreciate the kind words they have to say about us. Below are some snippet testimonials, for the full testimonials please click here.